An avocado contains 12.5% more potassium per gram than a banana - great for replacing potassium lost by the body during exercise, and staving off cramp. Avocados contain 11 of the 13 known vitamins and minerals essential to healthy. These include good levels of vitamins A, C and K, other antioxidants, and folic acid. With all of their nutrients—vitamins, minerals, proteins and oils—it's no surprise avocados are a nurturing beauty aid, both when we consume them and apply them directly. 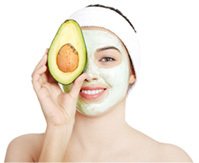 Avocados revitalize skin. They cleanse and hydrate it, improving its health, ultimately enhancing it with a smooth feel and soft, glowing appearance. They're also thought to stimulate collagen in the skin. People use this fruit to exfoliate and moisture rough, dry or flaking skin, to treat eczema and sensitive skin all over the body, to reduce age spots, to sooth sunburns and to increase the skin's elasticity. Avocados have a similar effect on hair, moisturizing and nourishing it to bring out its natural softness, luster and strength. Apply mixture to hair and allow to remain at least 30 minutes. Shampoo and condition as usual. Mash half of a Hass avocado, spread directly on a clean face and neck. Allow to remain for 20 minutes, then rinse with warm water. The creamy consistency and mild taste of Hass avocados make it one of the best first fresh fruits a baby can enjoy. It is also thought that introducing children early on to nutritious and delicious fruits, such as avocados, goes a long way towards ensuring they will continue to eat well throughout their adulthood. 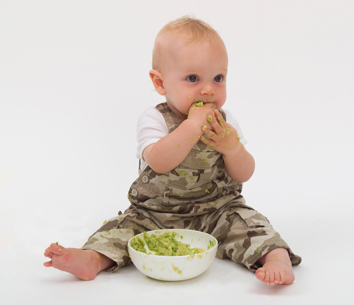 For a quick snack for infants, simply mash a ripe Hass avocado with a spoon and feed directly to your baby. As you begin to introduce a wider variety of foods, try mixing mashed avocado with apple sauce, peaches, pears, bananas or even yoghurt for a nutritious meal or snack. There is no fuss involved in preparing avocado for your baby – and no cooking either. They are perfect to pop in your bag, ready to be mashed when required. The only thing to remember is they are best eaten straight away once prepared. Note: Always check with your paediatrician before introducing your baby to a new food, particularly if your baby has food allergies.